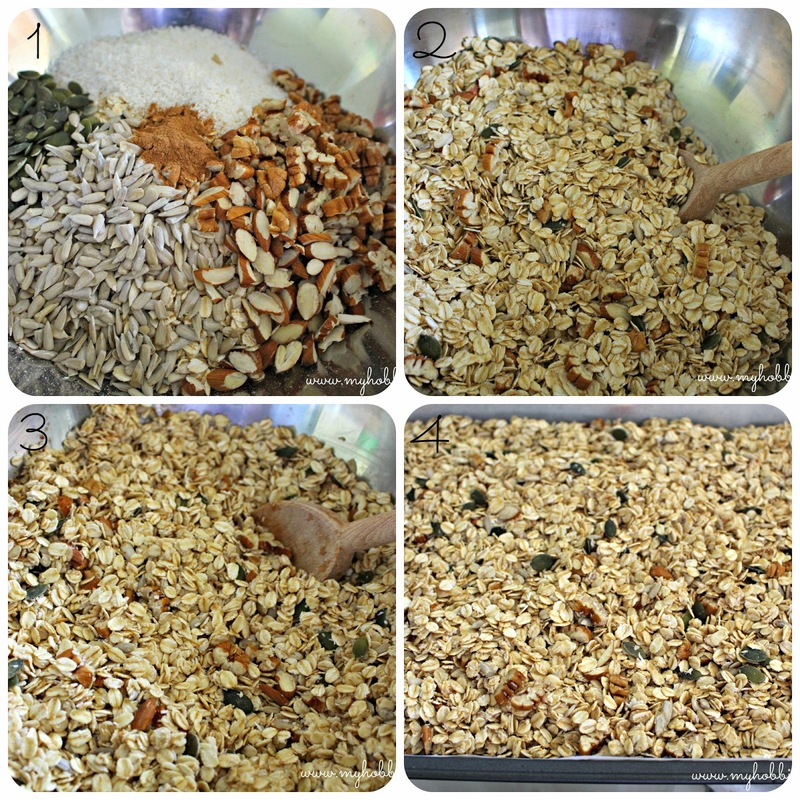 For this months reveal, I decided to try out her recipe for Macadamia toasted muesli. 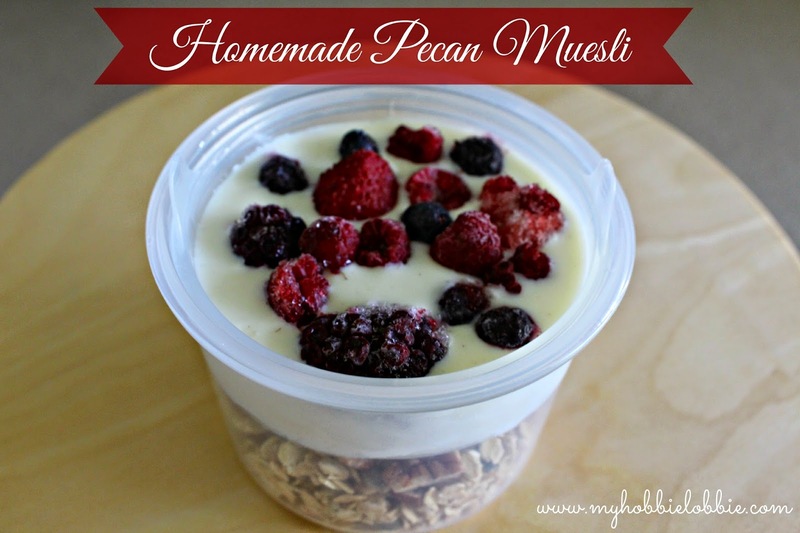 Very recently, I had tried out some muesli with pecans in it and I quite liked it. So I decided to swap in pecans for the macadamia. My next batch will be a macadamia one for sure. I have made muesli at home before. But what I really like about this recipe is that there is no added sugar. It just uses a bit of apple juice for sweetness and moisture. I used a juice without added sugar. It was really easy to whip up a batch. 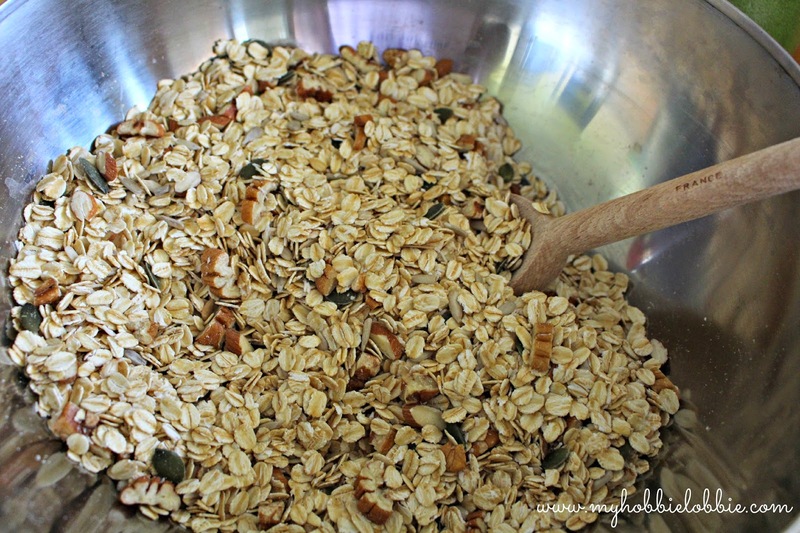 I don't know why I haven't been making my own muesli more often. Just four easy steps and pop it in the oven. 1. Measure out your dry ingredients in a large mixing bowl. 2. 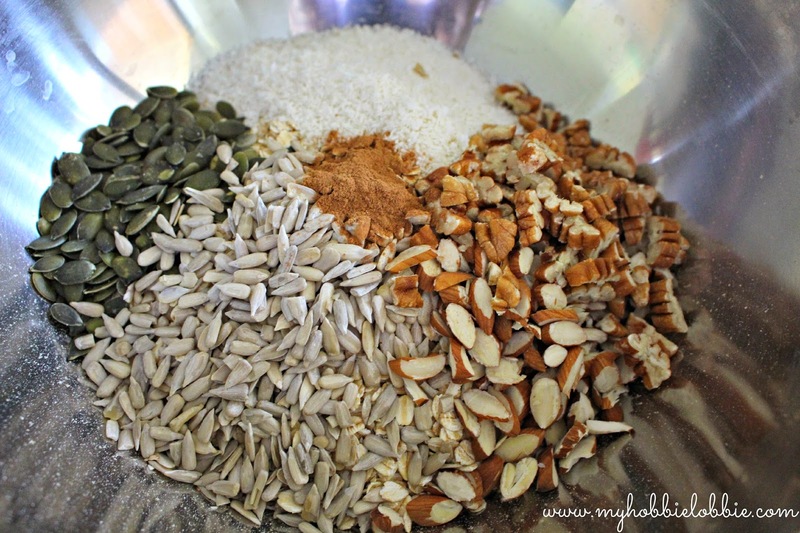 Mix the dry ingredients in the bowl. 3. Add the apple juice to the dry ingredients and stir through. 4. Place the mix on a baking tray that has been lined with baking paper and bake @120°C for an hour. Stir through with a fork every 15 minutes while it is baking to make sure the ingredients at the bottom get their time on the top to toast off nicely. 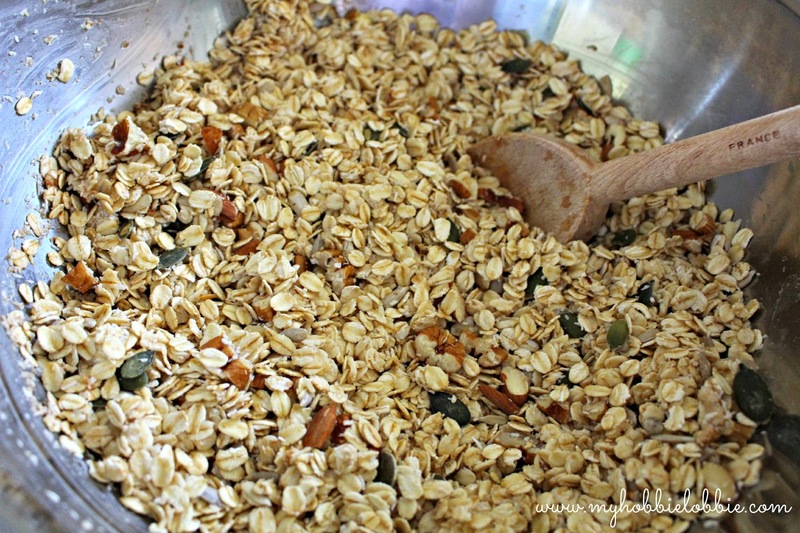 Let the muesli cool down completely before you store it. A little jar of this homemade muesli prettied up with some ribbon and a little gift tag would make such a nice little gift / hostess gift this holiday season. For a good breakfast to go option, serve up this muesli with yogurt and some berries. Look at what I found at the store recently; a little Sistema container that lets you keep your muesli and yogurt with berries separate so that it doesn't get soggy. 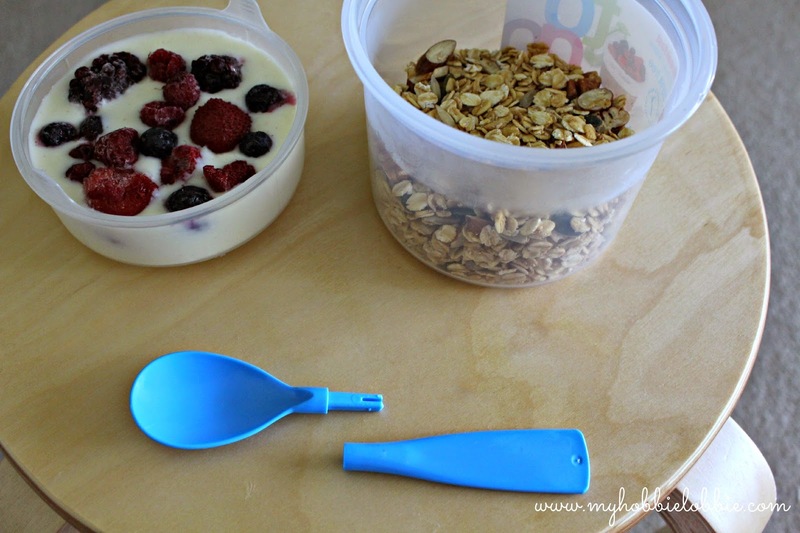 And the little yogurt container has a slot for a spoon too. I'm so glad I found it. I need to pick up one of these for hubby too. DISCLAIMER: This is NOT a sponsored post. I'm sharing a product that I find amazing with you. If you'd like to be a part of the Club and join in the reveals, you can read all about it and sign up here. We call it granola, too. Muesli would be all these same ingredients mixed together but not baked (I think). Either way - yummy! I love that the only sweetener is the juice, so I may have to try this very soon. That container is really cool! Thanks for sharing. I love any kind of granola because we can use anything we have on hand. This combination looks fantastic! What a brilliant container - you could use it for so many things. 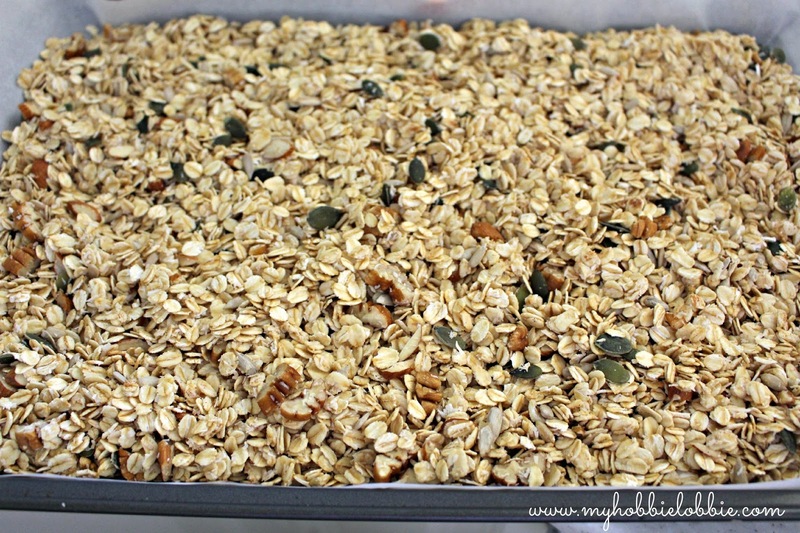 Love the look of the muesli too! What a fantastic way to start the morning with a bowlful of your muesli.